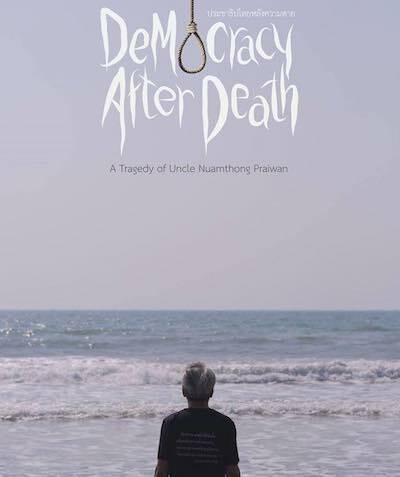 Neti Wichiansaen's documentary Democracy after Death: The Tragedy of Uncle Nuamthong Praiwan (ประชาธิปไตยหลังความตาย เรื่องเศร้าของลุงนวมทอง) is an account of Thailand's recent political history, bookended by the coups of 2006 and 2014. These events are narrated in a voiceover addressed to Nuamthong Praiwan, a pro-democracy protester who committed suicide in 2006. Nuamthong was also the subject of Prap Boonpan's short film Letter from the Silence (จดหมายจากความเงียบ). The film covers Thailand's polarisation between the PAD and UDD protesters, culminating in the military crackdown of 2010, "the most brutal political massacre in Thai history." As in Thunska Pansittivorakul's The Terrorists (ผู้ก่อการร้าย), former prime minister Abhisit is blamed for the massacre: "Directly responsible, Abhisit Vejjajiva holds Thailand's new record of the number of people shot by the military." Democracy after Death is significant for its inclusion of sensitive political events excluded from Pen-ek Ratanaruang's documentary Paradoxocracy (ประชาธิป'ไทย). It's also a refreshing counterpoint to Ing Kanjanavanit's Bangkok Joyride (บางกอกจอยไรด์), as it highlights the underhand tactics of the PDRC movement (extorting money and sabotaging the 2014 election). Whereas Bangkok Joyride is pro-PDRC, Democracy after Death is biased in favour of Thaksin Shinawatra, noting sympathetically that he "was forced to leave and has had to remain outside Thailand" though ignoring his corruption conviction. The film's director is also living in exile, due to a previous lèse-majesté prosecution, and Democracy after Death has been self-censored to avoid further charges. 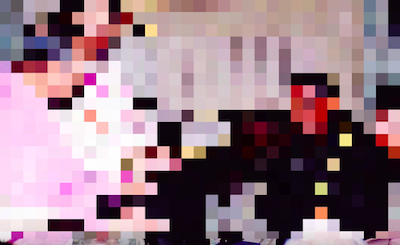 A photograph of the junta and Rama IX on the night of the 2006 coup has been pixelated, and a soldier's pledge of loyalty to the king has been bleeped out. Like the short film Narayana's Arrow Spaceship: Between the Orbits of Mars and Jupiter (ยานศรนารายณ์ ระหว่างวงโคจรดาวอังคารและดาวพฤหัสฯ), the credits are also self-censored.